The SDSS survey collects data with modern, digital detectors. 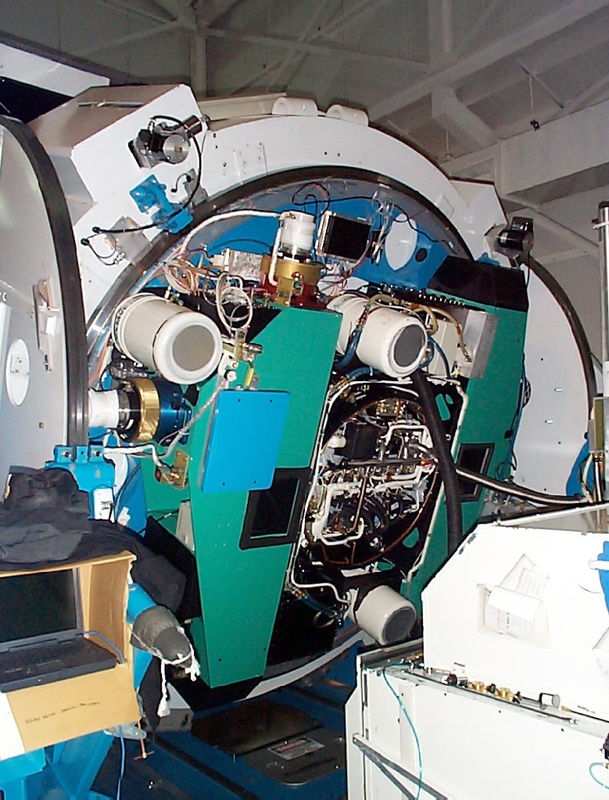 An enormous array of CCD detectors takes images, and a pair of spectrographs, fed by optical fibers, collects spectra. The inner sanctum of the SDSS telescope contains what may be the most complex camera ever built. The camera includes 30 electronic light sensors called charge-coupled devices (CCDs) like the one at left, each two inches square. The CCDs are arranged five to a column, and scientists encase each column in a vacuum-sealed chamber. To enhance sensitivity, liquid nitrogen cools each chamber to -80 degrees Celsius. Each CCD is made up of more than four million picture elements (pixels) that release electrons when they absorb light. 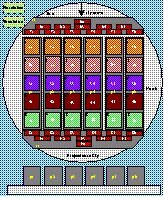 The electrons are then amplified into electronic signals that can be digitized, recorded on tape and ultimately fed into a computer. Each of the five rows of CCDs receives light through a different colored filter, so each row records the brightness of objects in a different color. A night of observing will produce up to 200 gigabytes of data on a dozen tapes. The drawing to the right shows a schematic view of the camera. Unlike a typical camera, this one doesn't snap a still picture. Instead, the telescope is parked in a given position, and as the earth rotates, the sky moves over the camera, from top to bottom. The electrons released by the incoming light are moved (or clocked) along the CCDs at the same rate that the sky moves over the camera, ensuring that the signal is always gathered from the same objects. When a moving electron hits the edge of a CCD, it is read out through amplifiers. This readout is done continuously, resulting in long, skinny strips of sky imaged in one observation. 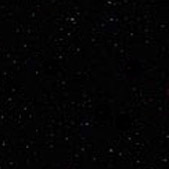 Because the CCDs have spaces between them, to make a full picture, the telescope must be moved a little bit, and a second, slightly offset strip is imaged. A pair of strips is then combined into a single stripe, which has no empty areas. [1 Å=10-10 meters] on 2048 x 2048 CCDs. To increase the resolution of the spectrographs' data, light from each object is split into a blue half and a red half, and the spectrum from each is recorded on a separate CCD. The splitting is done by a beamsplitter with a special coating. The coating reflects the blue half of the spectrum while allowing the red half to be transmitted. 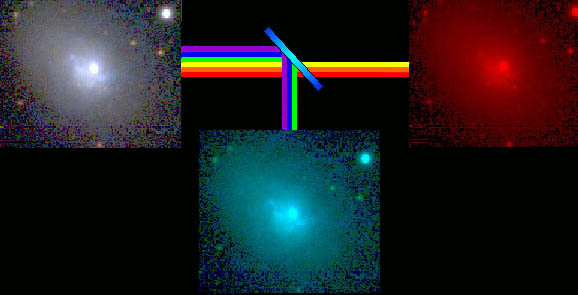 Because the light is split, four images are created for each spectroscopic observation: both a red and blue image for spectrograph #1 and also for spectrograph #2. The plug plates are placed at the focal plane of the telescope, just like the CCD camera. On a good night, SDSS astronomers will use six to nine plates, obtaining spectra for up to 5,000 objects! The spectrograph observes all galaxies seen by the imaging survey at magnitude 17.8 or brighter and also targets quasars, stars and many other objects, such as X-ray and radio sources.